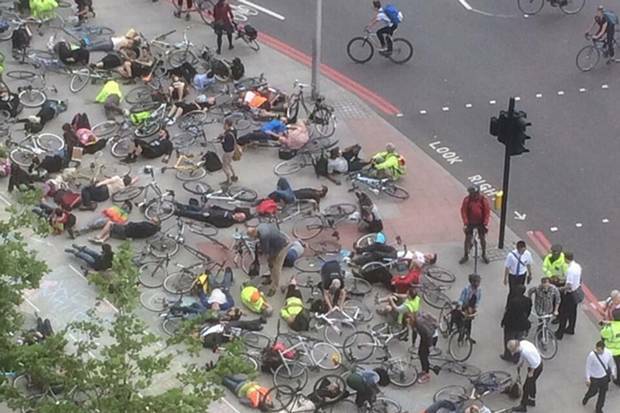 3 cheers for the cyclists who staged the “Die-In” at the Elephant and Castle roundabout yesterday (see below). Over 400 cyclists lay down in protest at the dangerous conditions of busy commuter roundabout after the recent death there of Adbdelkhala Lahyani, becoming the 5th cyclist killed already in the Capital this year. The protest was arranged by the group Stop Killing Cyclists, campaigning “peaceful[ly] but more radical[ly]” and urge all road users to join their protests.